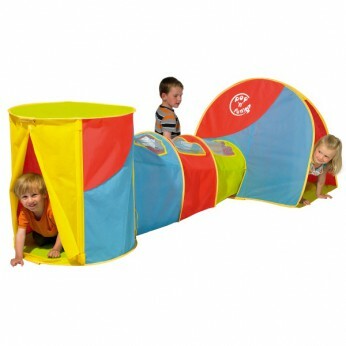 Combines large pop up play tent with sewn in ground sheet, fun cylinder and connecting crawl through tunnel. Use together or as separate items to promote physical activity and hours of active fun both indoors and outside. Quick and easy pop up assembly that also folds away in seconds for compact, portable storage. Dimensions: Approx 200L x 80W x 70H cm. Styles and colours may vary…. This toy costs approximately £27.99 (for the latest and best prices make sure you check our retailer list for the Pop Up Combo above). In our review of Pop Up Combo we classed it as being suitable for ages 3 years, 4 years, 5 years but recommend you check the manufacturer specific advice before purchasing.